So what can an autocrosser do when the snow's still melting and racing's not possible? Arm chair racing. One of my favorite forms of arm chair racing is messing with statistical comparisons analyzing my past results. It's of course true that "past results do not guarantee future success", but they can be entertaining. This time I'm entertaining myself by trying to determine if my car is a good car for racing in the SSM class. The last race of the season, I co-drove the car with an 18 year veteran racer. He is a top competitor at our regional races often placing in the top 5 or 10 out of 100+ drivers. He's driven my car twice, the second time at the New England Region Solo season finale (the event where the Stirling Moss season championship is held). This means that he has had a chance to get used to the car and his times might begin to represent what my car is capable of in the hands of a good driver. In other words, it's an opportunity to measure how my car might do on the national level (if I got better at driving it). While it's easy to compare times within a single event, comparisons between events are not so easy. Every race has a different course. 55 seconds might be blazing fast on one, and dog slow on another. In order to make a comparison one needs to figure out what the relative length/speed of the two courses was. Our region is possessed of 30+ people who went to the 2010 SCCA Solo II National Championships, 18 of whom raced the same cars at the season finale. To convert my times and Brian's times to the equivalent times at the National Championship, I calculated the ratio of National Time to Finale time for all 18 drivers, and averaged them. It turns out that the times people put up (over 2 days) at nationals average 2.42 times longer than their times at the finale. Brian would have come in 16th out of 26, 10 seconds from first and 5 from a trophy. I would have come in 24th. However there's a lot of variation in the numbers so I calculated a confidence interval and it turns out that we can only say that there is a 95% chance that Brian would have placed between 4th and 23. In other words there's not much chance of his coming in first or last, but claiming an exact placement is simply beyond the capabilities of this analysis. The conclusion is "somewhere in the middle". It's also worth noting that there are some not to exotic mods that could be done to improve my car by somewhere around 6-7 seconds (on a 120 second 2 day 2 course time such as nationals). Here's the list in the order I think they should be fixed (which also happens to be ascending price order). With that done, and a 6-7 second boost Brian would be somewhere between 6th and 8th at nationals. It would be conceivable to trophy at nationals in my car without spending a fortune on it. Winning... well that probably requires a serious effort to maximize the power output from the car. Stroke the engine, reduce the tire diameter, lower the ride height, change the transmission, race clutch, lightweight flywheel, port/polish the engine, new valves, dyno custom tune (multiple times), header, de-cat, race gas... etc. A far simpler analysis also lends one to believe that an Elise may not be hopeless in SSM at the national level. 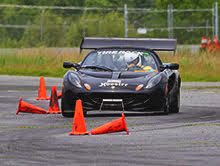 The top super-stock driver ran a 2007 Elise and his time would have made 4th in SSM. In 2009, 12th, in 208 5th, in 2007 1st.... for an average of 4th place. One big question is when did it rain? (which also may add a lot of variance to my above analysis too.